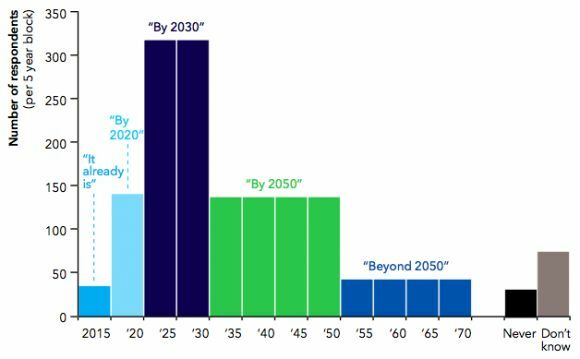 Could renewables account for 70 percent of power generation in the coming decades? According to a majority of energy industry experts surveyed by the advisory firm DNV GL, the answer is yes. Eight in 10 of the 1,600 respondents from 71 countries (including project developers, generating plant operators, integrated utilities, distribution system operators and government representatives) said achieving 70 percent renewable energy penetration in their markets of interest would be possible by 2050. Not surprisingly, system operators and integrated utilities were slightly more skeptical, but did not show a large variation in opinion, said Felicity Jones, survey author and senior consultant at DNV GL. Even assuming a slight overall bias among those who chose to respond to the survey, “it provides a view that substantial upscaling of renewables is possible in our lifetime," she said. Responses to question: How quickly can the transition be made to a high renewables electricity system (70% generation) which is also secure and affordable in your market(s) of interest? The vast majority of respondents (two-thirds) selected politicians and policymakers as one of the top three most vital sets of players in this quest. “Seventy percent renewables is not mainly a technical or commercial discussion. It is mainly a political question," said Sven Utermöhlen, director of construction and engineering for the major German investor-owned utility E.ON, who was interviewed for the survey. In a landmark move, E.ON announced late last year it is spinning off its conventional power business to focus on renewables, distribution networks and customer solutions. "The new energy world is not centered on the system but on the consumer," said Utermöhlen. "Key success factors are a sustainable and clean brand, rapid product development, innovative solutions, digital integration and smart distribution. In the conventional energy world, the key aim is to deliver security of supply. To deliver simultaneously in both the new energy world and the conventional energy world in a single integrated company will become increasingly difficult." E.ON fully expects renewables to increase their share of generation globally, albeit at different paces in different countries, said Utermöhlen. The main risks, he said, are the cost of energy supply and sustainability falling down the political agenda. Another concern is that policymakers are squarely focused on affordability, measured through the metric of levelized cost, which determines the cost of generation from alternative technologies in isolation. But in a world with high levels of renewables, where there's a high level of complexity in network planning and operations, "[m]easuring generation costs becomes a less robust basis for making decisions about the optimal mix of technologies, and the metric of reliability becomes more important," according to the report. "The renewable sector is caught between the two competing pressures of affordability from policymakers and reliability from system and network operators," said Jones. "In future we need to move beyond levelized cost to better capture the growing demands of system operators." Response to question: Whose involvement do you think is most vital in the transition to a renewables-based electricity system in your market(s) of interest? The DNV GL report calls for stronger market signals for a kilowatt-hour generated at a specific time, in a specific place. System operators should also redesign ancillary markets to enable the full participation of renewables. Of course, that's easier said than done. 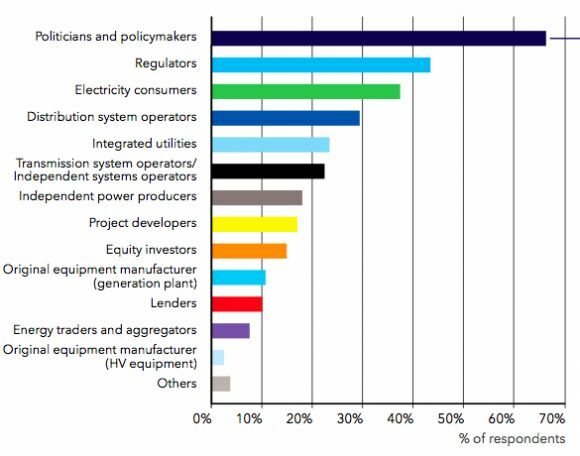 Survey respondents acknowledged that system and network operators are most likely to feel challenged by a high renewables scenario. And while some are willing to take on the challenge of reforming their system, others are actively trying to avoid it. “I think my utility and others will sit back and do nothing while the ‘future’ is shaped around them. [...] We seem to think if we bury our head in the sand and not react, maybe it will all go away," said one project manager at an integrated utility in North America. Meanwhile, project developers, generators and independent power producers see a sizable opportunity. This is a worrying trend, said Jones, because the importance of the grid is only increasing. "We’re moving from an era in which generation is king, to one in which the grid is king," she said. "The polarization of views between those developing new technologies and projects and those who operate the system is alarming and must be addressed," according to the report. 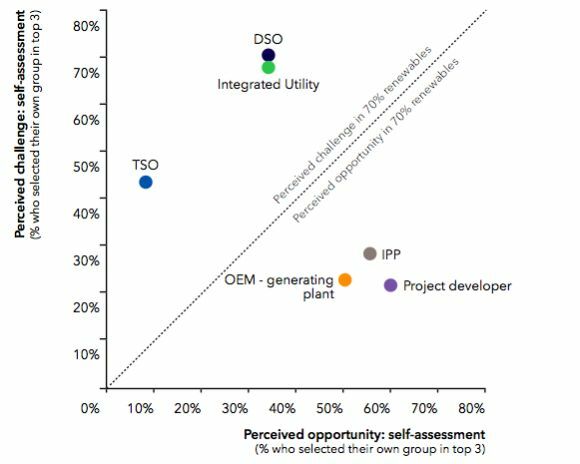 Response to question: The transition to a renewables-based electricity system poses the greatest challenges/opportunities to which stakeholders in your market(s) of interest? The solution lies in changing market mechanisms and reforming regulations. At the same time, the power sector needs to break down traditional industry boundaries and think about sectors like electricity, heat, storage, transportation and communications as part of a holistic system. 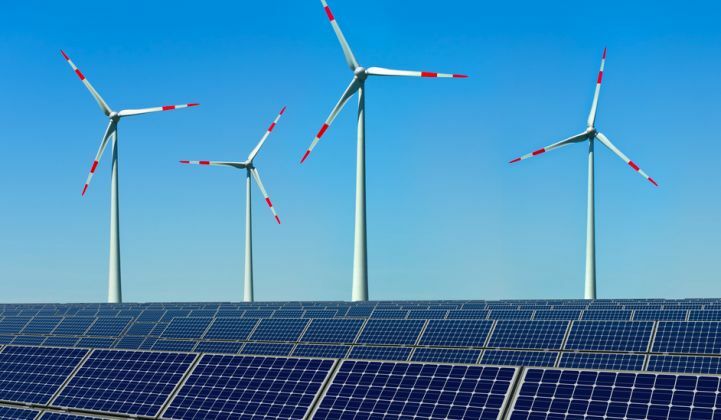 "To unlock the potential, we must shift away from a mindset in which renewables are considered a nuisance to be grudgingly accommodated, and instead adopt a broader view," according to the report. The industry, overall, needs to be more entrepreneurial, said Jones. "We need to get smarter, or get out of the way."